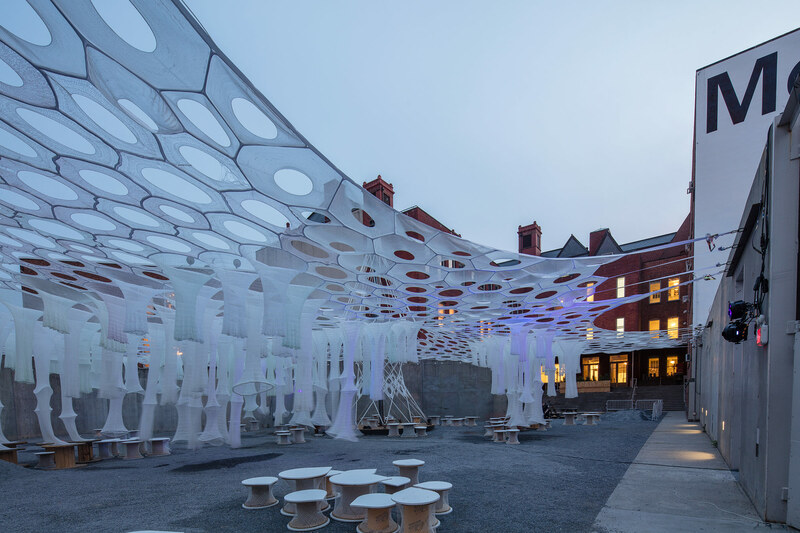 This year marks a new direction for the MoMA/PS1 Young Architects Program (YAP), and it shows in Jenny Sabin Studio’s Lumen, the series’ 18th annual installation. 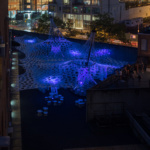 After a few years focused on creating awareness of ecological and sustainability issues, the program has taken a slightly different course, as the brief has expanded to include a more rigorous engagement with the popular Warm Up summer music series, now in its 20th season of sweaty, raucous parties in the museum’s courtyard. 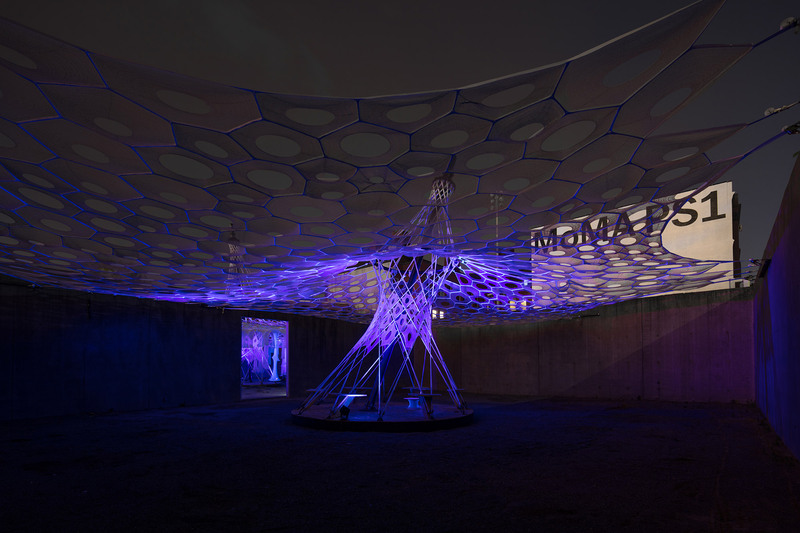 Set to open on June 29, the project features a woven canopy that will subtly change color in the daytime, and will glow in the dark and be illuminated at night. 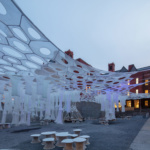 The large fabric shade system will address several of the programmatic issues of YAP that have fallen by the wayside in years past, including an integrated lighting system to accompany the musical acts, a misting system to cool visitors, and over 100 seats scattered across the courtyard. 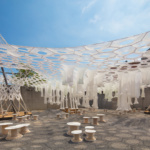 These features follow the ethos of YAP much more closely, which, according to its mission statement, is to provide “shade, seating, and water,” in addition to meeting its sustainability goals. 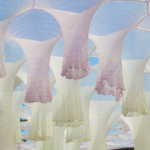 To address these newly reinvigorated concerns, the designer set out to create an immersive environment, not an object. 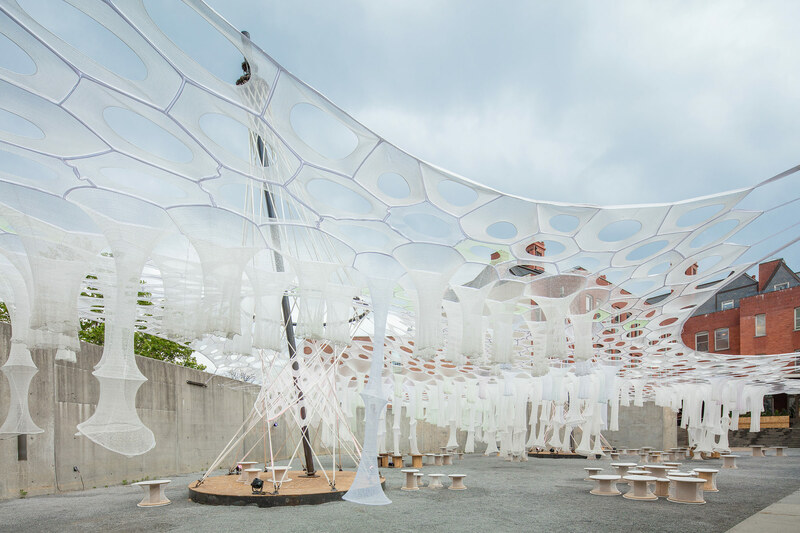 For Sabin, cells provide an ecological model for architecture, because cellular networks respond to their environments by morphing their structures, volumes, and surfaces to produce form through geometry and material. 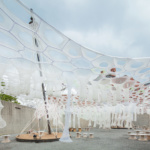 Alongside her experimental design practice, she is an assistant professor at Cornell University where she leads the hybrid research and design network LabStudio with Peter Lloyd Jones. The collaborative—based at Cornell University, the University of Pennsylvania, Stanford University, and in Los Angeles—includes extra-disciplinary actors like material scientists, cell biologists, matrix biologists, and physicists. In working with these professionals, she has developed a specialty in applied research and architecture that results from what she calls “active datascapes,” such as those found in biology, mathematics, or cellular biology. Research into biological processes has led Sabin—alongside collaborators such as the textile designers at Nike Flyknit Collective—to develop new tools and methods for prototyping and making, especially in the realm of fabric architecture. 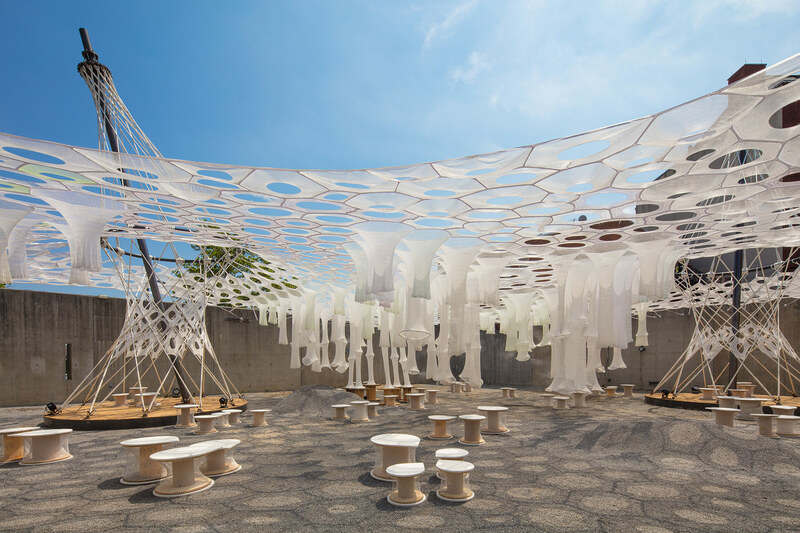 While these might seem like disparate areas of interest, knitting’s performance and flexibility allow concepts taken from cellular research to come alive through digital models and simulations that can respond to particularities in physical contexts. This is the framework from which Lumen arises. She also cites weaving workshops at the Bauhaus and their early proto-parametric attempts to link computation, geometry, and materiality as precursors to her work. At the Bauhaus, it was women’s labor that made innovative strides in textile manufacturing. 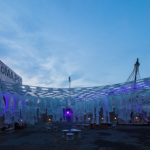 Similarly, for Lumen, this new type of making—and new workers—digital tools and robots—have made it possible to produce much larger and intricate output. 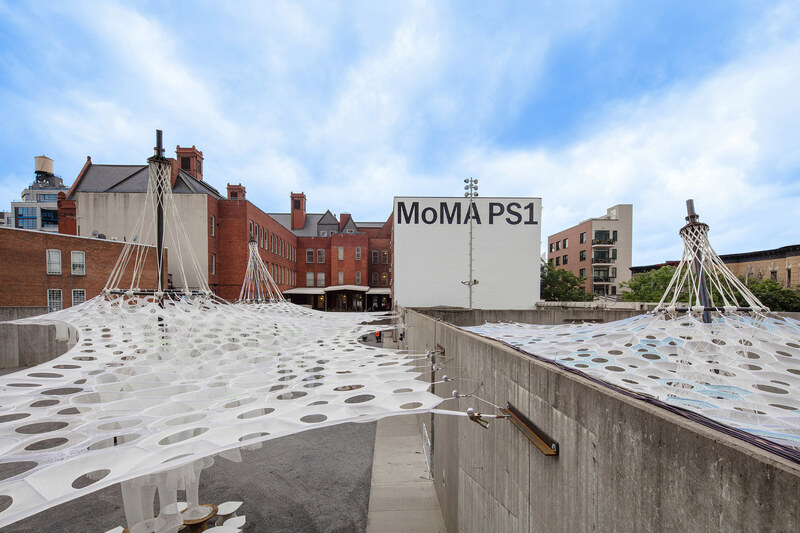 Labor is always an issue at ambitious experimental installations like MoMA/PS1 due to budget constraints and anything that can increase the effectiveness of the end result without increasing the need for volunteers is much welcomed. 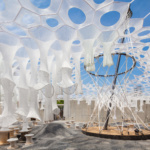 Lumen is tied with SO-IL’s 2010 Pole Dance for largest ever YAP structure in square footage covered—and thus shaded from the intense sun— in the courtyard. 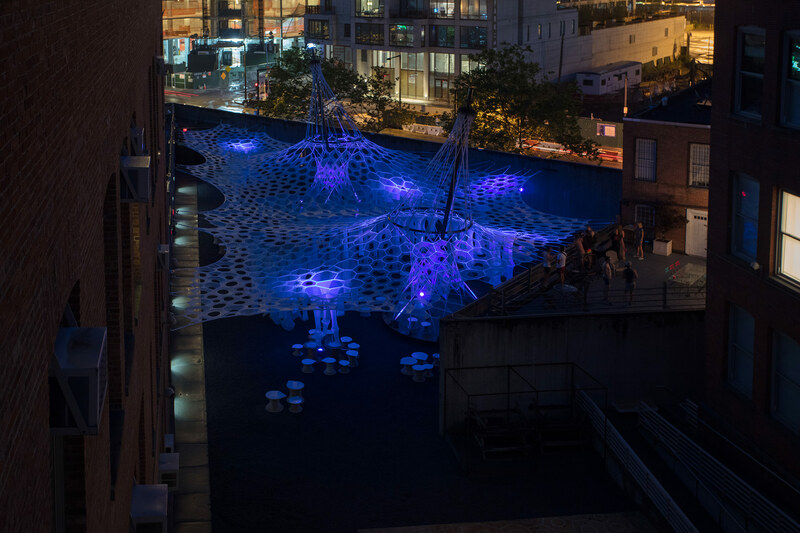 “I was confident about the amount of research and development that went in to this,” Sabin told AN, “So I felt comfortable pushing it to this scale.” Lumen produces effects through new materials and construction methods, most notable the use of two different high-tech responsive fibers. Elements knitted with SolarActive thread—one that changes when exposed to UV—will bring the white structure to life in different subtle hues of blue, orange, purple, and green. At sunset, these will be slowly joined by other cells that are made from photoluminescent (glow-in-the-dark) threads. 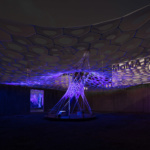 Neither effect is overwhelming, but they are augmented by a light show that is integrated into the structure and will be programmed to change throughout the evening. 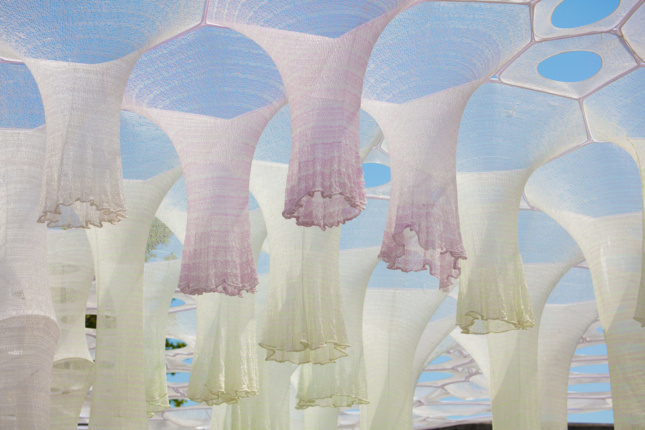 To create the structure, roughly 250 standardized fabric cells using one million yards of thread were produced on digital knitting machines at Shima Seiki, a garment manufacturer that specializes in seam-free knitting technology. 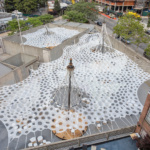 These cells—in three sizes—had the same circumference until they were fitted into the canopy, where they stretched to conform to the structural stress diagrams derived from shade and heat analyses of the courtyard. 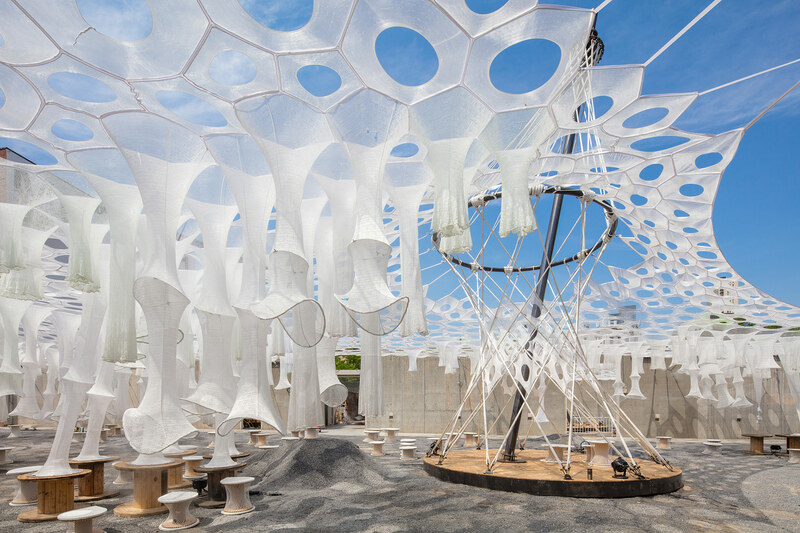 The knitted cells were then sewn together with a secondary structural webbing, which was mapped on a 1:1 scale plan drawing of the entire canopy. 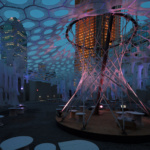 For structural support, three steel tensegrity towers provide support in the middle of the structure. The mast is in compression, but the load is carried by a post-tensioned rope system that was fabricated by a custom fish-net maker. Visitors can hang out on the platforms under the ropes, and beer tickets will be sold from inside the tower in the smaller side courtyard. 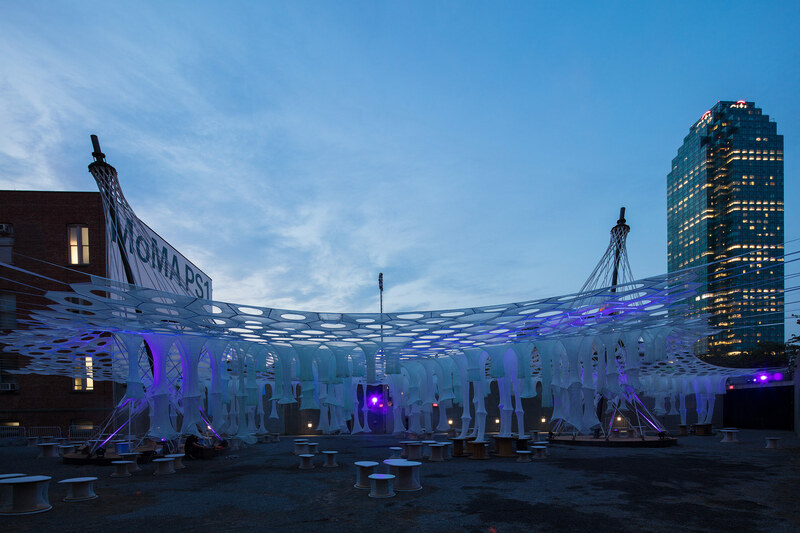 Warm Up­–goers will also be able to find a set on one of 100 “spool stools,” which were produced by cutting old plywood spools into saw blade–like pinwheels, onto which a robot spun photoluminescent thread around the perimeter. 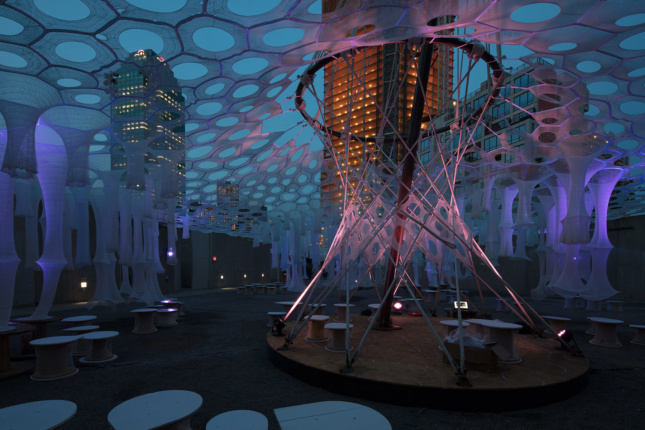 Sitting will be an option again this year, and as users pass through Lumen, sensors in hanging cones (sometimes called stalactites) that will respond to their motion and emit clouds of mist that will cool people down as well as the change the microclimate of the courtyard. 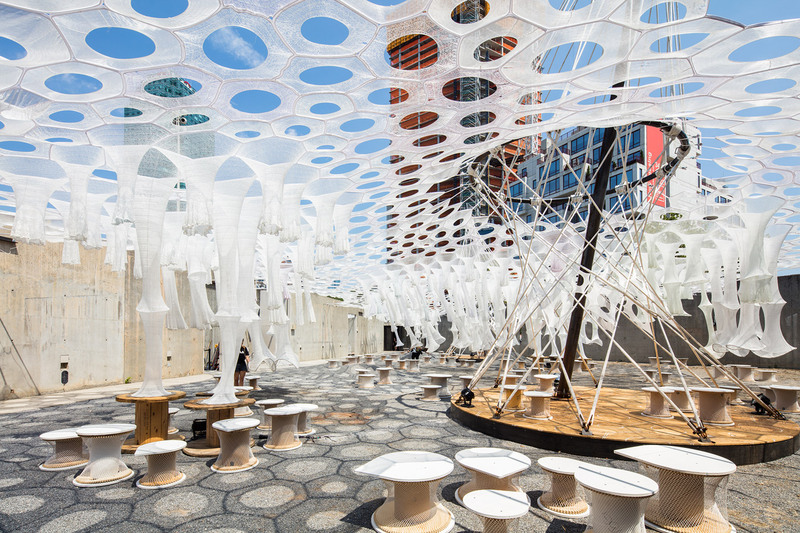 These organism-like features will allow the architecture to help to create multiple experiences and engagements that celebrates human interaction and change, as it will be different during daytime, sunset, and at night. 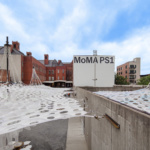 This renewed focus on the programmatic opportunities of Warm Up will be fun, but the project also points to the continued evolution of advanced fabrication, as it starts to scales up, moves outside the gallery setting, and subsequently becomes more mainstream. As the generation of architects who pioneered these digital techniques over the last couple decades start to get really good at executing them at larger scales, we will see more of these projects living longer and in more influential settings. 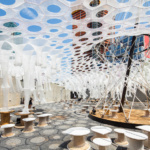 Additionally, the shift in the Young Architects Program from primarily ecological and sustainability issues to immersive qualities and experience is a welcome one. The courtyard provides a special context and programmatic challenge for elite architects to design for a world-class outdoor music event. 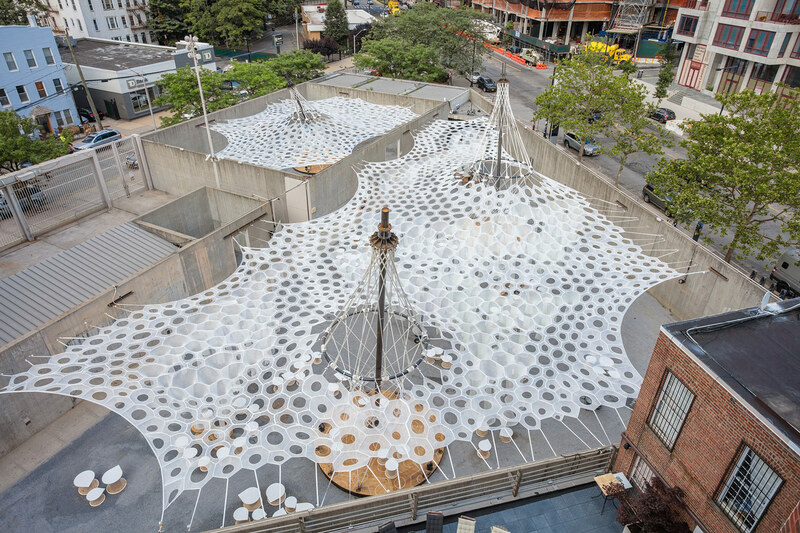 Whether the discipline writ large will follow the same trend toward this type of engaging work is unclear, but due to its scale and immersive environment, Lumen serves as good starting point for understanding how physically present structures and environments can be leveraged to connect the public to architecture outside of the discipline or the gallery. Misting systems Sabin Design Lab & Mist Cooling Inc.